Blessed John Henry Newman RC College is a new College and is made up of the remaining two Catholic Secondary schools in Oldham, St Augustine of Canterbury Werneth and Our Lady’s Royton. The schools joined together in September 2011, at present are working from both sites but will be moving into their new building in September 2012. Lorraine Moore worked as an intervention Teaching Assistant at St Augustines, mainly within the Science Dept. In October 2011 Lorraine found a lump in her breast and by December she was diagnosed with breast cancer which was terribly aggressive. Lorraine lost her battle and died at the age of 37. She fought her battle with so much courage and dignity. Last year around 20 members of staff joined together and took part in Race For Life in memory of Lorraine and others who have fought and battled cancer, they raised just short of £1000. 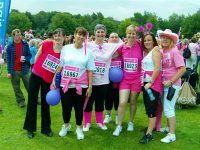 Dawn Gladrey will be taking part in this years Race for Life on June 23rd at Tatton Park. She will be raising money on behalf of Lorraine who worked very closely with Dawn at St Augustine of Canterbury. Everybody at New Directions Education wishes Dawn and all participants the very best for the 23rd.